For its sophomore issue, Southwall Magazine of Cebu features the President and CEO of CM and Sons Food Products, Inc. — Jonathan Manuel T. Lo. He hails from Bacolod City, Negros Occidental, Philippines. 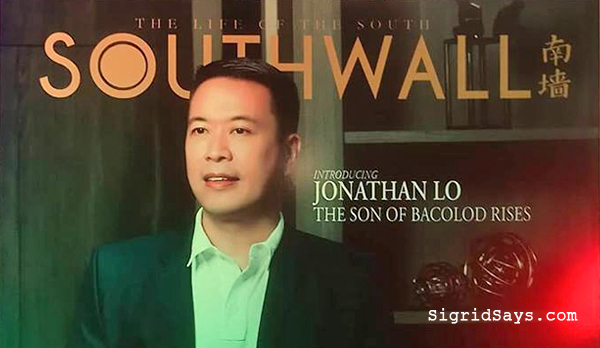 Southwall Magazine features highly successful Bacolod businessman Jonathan Lo — President and CEO of CM and Sons Food Products, Inc., makers of the famous Merzci Pasalubong products. Photo by Val Itumay. 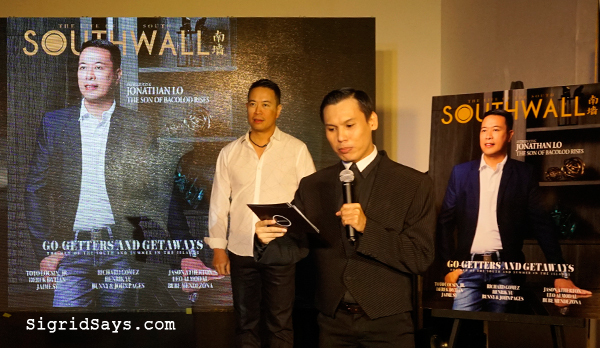 As a passion project, Southwall Magazine was launched in 2005 in Cebu City. It took a 12-year hiatus and was recently launched as an elegant, glossy lifestyle magazine. Here in Bacolod, they unveiled their second issue that features the formidable force behind CM and Sons Food Products, Inc. on the cover. He is none other than the President and CEO, Jonathan Lo, the prime mover and innovator of the Bacolod pasalubong industry. 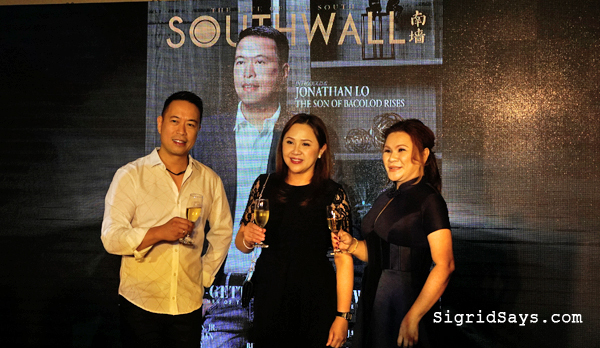 The glamorous unveiling event at Gallery Orange was hosted by Southwall Magazine managing editor, Rione Palacios. In this issue, Lo is joined by other successful men in the Visayas, namely, John and Bunny Pages, Derek Dytian, Henrik Yu, Jason Atherton, Mayor Richard Gomez, and Leo Locsin Jr.
Southwall Magazine published, Ms. Caroline Tan Porras, raises a toast for Mr. Jonathan Lo. Two decades ago, Bacolod City was already gaining popularity among local and international tourists, especially with the MassKara Festival. But looking back, the Bacolod pasalubong industry, though existent, was rather in a sleepy state. 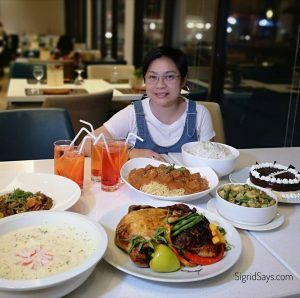 Experiencing success in the bakeshop, fastfood, and purified drinking business, Lo boldly made the move to conquer the pasalubong arena. He was faced with criticism and discouragement because there were already many Bacolod pasalubong brands at that time. He listened but pressed forward. 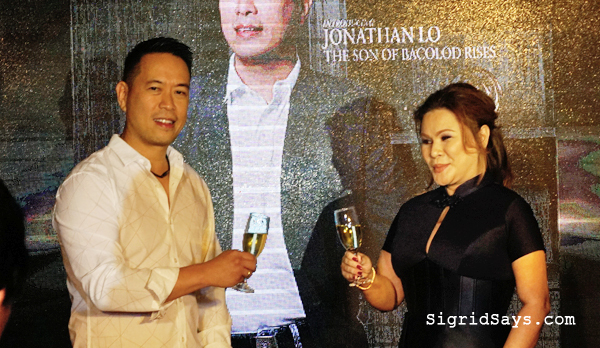 Jonathan with his beautiful and supportive wife, Lisabelle Suaboksan Lo, and Ms. Caroline Tan Porras. Armed with a vision for the business and a big faith in God, Lo sprang head on. Before others realized it, he quickly made improvements and innovations that affected the entire industry–not just his brand. He started with the packaging, the distribution, and then having a comfortable, air conditioned pasalubong center. Without hesitation, he expanded. All of these things happened in just months. That’s how fast he works and acts on his plans. For the first time, Bacolod saw a pasalubong brand that actively promoted the city’s and the province’s tourism. We have seen colorful photography in advertising collateral as well as glossy and well designed product packaging. Merzci Pasalubong became a byword in local events. They even bought their own new and comfortable Merzci tour bus that is for rent for tour groups. Furthermore, Lo’s movements for the Bacolod pasalubong industry has inspired other companies to also improve. Everyone realized that this industry has much room for growth. 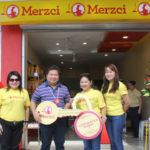 And Merzci Pasalubong became a brand that has made an indelible mark in the Bacolod tourism industry. 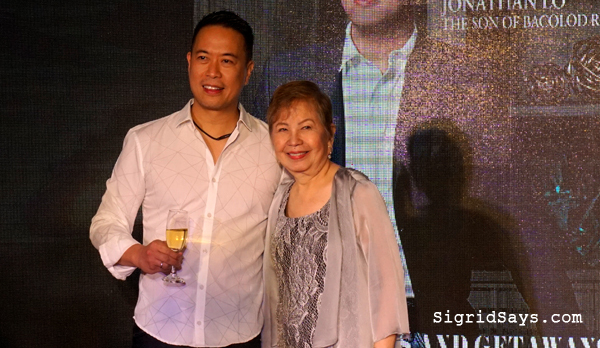 The CEO with his mother, Mrs. Corazon Lo, of Negros Grace Pharmacy. It has been 23 years already. 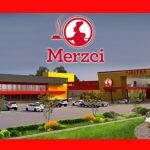 At present, they have more than 50 branches, all housing the Merzci brands — Merzci Breads, Merzci Pasalubong, Merzci Purified Drinking Water, and the Merzci Snack Bar. Lo cemented his reputation as one of the most successful and formidable young entrepreneurs of Bacolod and Negros Occidental. 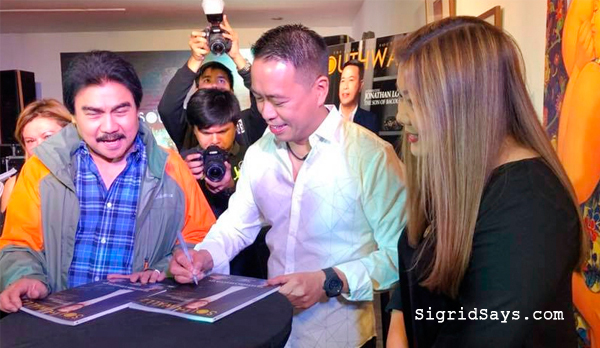 The launching event of Southwall Magazine in Bacolod was attended by Bacolod Mayor Evelio Leonardia and Councilor Cindy Tan-Rojas. Here, Mr. Lo signs the mayor’s copy of the magazine. Photo from Coun. Tan’s file. CM and Sons started with a bakeshop and a snack house. In January 2005, the company launched its newest line — MERCZI PASALUBONG TREATS. It is a new Bacolod pasalubong line to cater to the growing tourist crowd that regularly visits the province of Negros Occicental. The pasalubong treats have gained a massive “suki” consumer crowd for tourists and locals. This prompted the company to open its first ever Bacolod pasalubong center in Singcang, Bacolod City a few months later. The branch is only about five minutes away from the old Bacolod Airport. Seven months forward, a second Bacolod pasalubong center was opened in Mandalagan. It caters mainly to customers leaving the city on the way to the new Bacolod-Silay International Airport. Travelers heading to Northern Negros can also easily pass by here. A new branch was also opened at the pre-departure area in 2008 when the Bacolod-Silay Airport started service. Eventually, the BREDCO Branch was established to cater to the Iloilo-Panay travelers taking the Fast Cat and other sea transport. Merzci Pasalubong Center in BREDCO port and the Merzci tour bus. 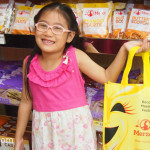 At present, Merzci Pasalubong is available in more than 50 branches. They have stores around Negros Occidental, in Negros Oriental, and Panay. They also have many dealers around the country. This include sellers as far as Tuguegarao City up north, Zamboanga City, Manila, and Cebu. Moreover, some products are also exported by international distributors to Canada, the USA, and Middle East. Not many people know this, but I have worked with Mr. Lo during the fledgling days of Merzci Pasalubong. He is one of the most exacting bosses you’ll ever meet, motivating you to push your boundaries to personal excellence. Blessed to have worked with him. He has shown so much kindness to our family. 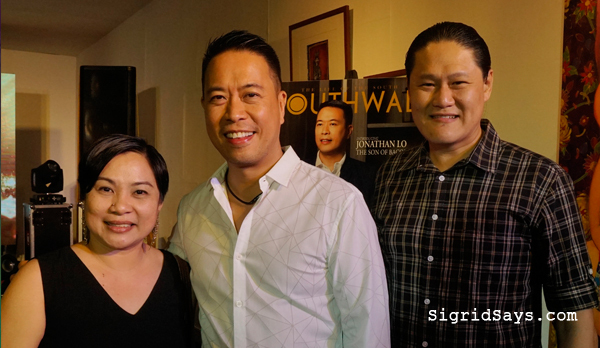 🙂 Pictured here with my husband, Dennis, during the Southwall Magazine launch. Southwall Magazine looks fantastic. You should feel so proud of all of the accomplishments. I love all of the lifestyle elements and especially the candid photos. Southall magazine sounds interesting and stylish featuring great content. It’s good to read about companies that inspire and do well. Johnathan Lo sounds like a man who knows what he wants and what’s good for his business. 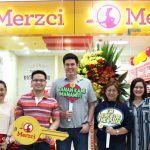 Merzci Pasalubong is definitely going places and I can imagine that it’s only going to get more successful. It sounds like Southall magazine is a really great and interesting read. Mr Lo sounds like a brilliant business man too. Southall magazine seems like a very well known magazine. And Mr. Lo really is a person with a keen eye to find his kind of interest in the business. Nice article! Southall magazine looks interesting to read. would love to read this magazine sometime.